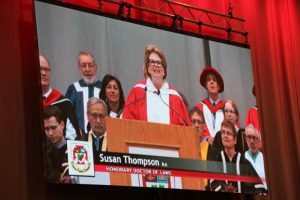 On June 10,2016 , Susan A. Thompson received an Honourary Doctor of Laws from the University of Winnipeg. Among the most significant acts undertaken by our University is the awarding of honours to individuals who have achieved great distinction through their contributions to the University and/or the local or global community. 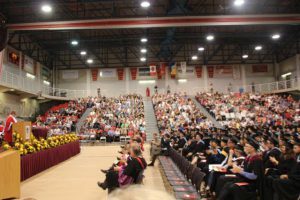 Honorary degrees and fellowships are awarded at Convocation on the authority of the Senate, and the Senate selects those to be honoured on the recommendation of its Honorary Degrees Committee. DD (Doctor of Divinity) – This degree is conferred upon an ordained or consecrated member of the clergy for service in ministry. The DD was the only honorary degree conferred by this University prior to 1967. LLD (Doctor of Laws) – This degree is conferred upon those recognized for service to the community, and for those recognized for scholarship in academic disciplines other than the sciences. The LLD is the most frequently given honorary degree, and was first conferred in 1968. DSc (Doctor of Science) – This degree is conferred for scholarship in the sciences. The first DSc was conferred by this University in 1982. LittD (Doctor of Letters) – This degree is conferred upon those the University wishes to recognize in the Literary, Performing, Visual or Fine Arts. The LittD has been conferred by this University several times since 1986. 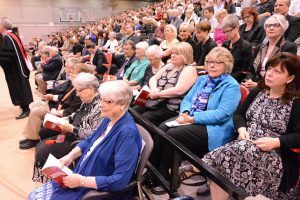 Susan has always been most grateful to the University of Winnipeg for the impact it has had on her life and the importance it has played in making her life move forward in many significant ways. 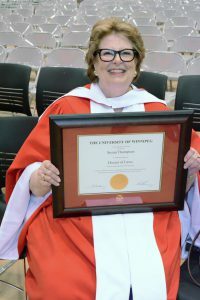 She was deeply honoured to have received an Honourary Doctorate of Laws from the University of Winnipeg. 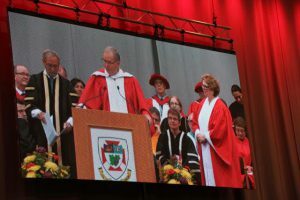 To have received and Honourary Doctorate from the University of Winnipeg is indeed an honour to be cherished for a lifetime.